SC Villa PRO Sharon Adong during the burial. 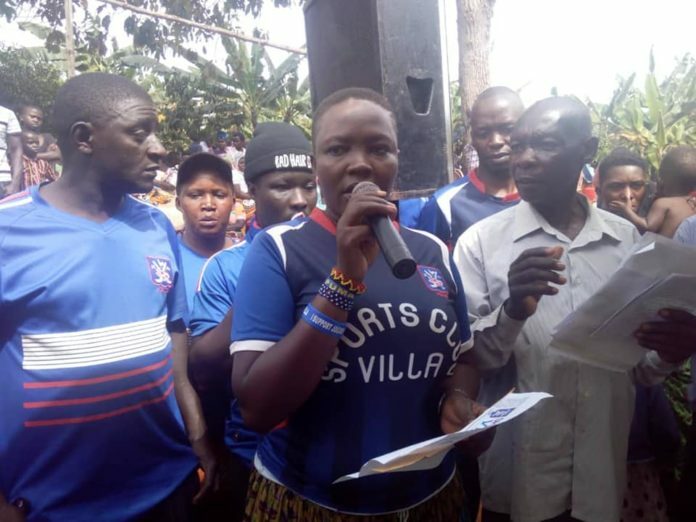 One of SC Villa Jogoo’s gallant fan, Jimmy Mawanda was laid to rest in Kalungu district on Monday. Mawanda was knocked down by a moving vehicle in Kibuye on Saturday while celebrating their famous 3-1 victory over Vipers SC at St. Mary’s stadium. He was injured and rushed to Mulago hospital but unfortunately pronounced dead on Sunday. “We said farewell to our Blue Brother Mawanda Jimmy at Kulungu district yesterday. Thank you Jogoo family for the love you showed yesterday to the grieved family. RIP brother.” SC Villa Jogoo posted on Facebook on Tuesday morning. A number of Villa Jogoo fans and Club PRO/Media Officer Sharon Adongo attended the burial On Monday in Kalungu District. SC Villa’s goals were scored by Lwanga Charles, Pius Wangi and Semujju Joseph. Tito Okello scored for the Venoms.